Located opposite Saveur on Purvis Street, Gunther's was named New Restaurant of the Year in the World Gourmet Summit Awards of Excellence 2009 as well as Restaurant of the Year and Outstanding Caterer of the Year at the World Gourmet Summit Excellence 2012. Opened by award winning chef Gunther Hubrechsen who helmed Les Amis for more than five years, the fine dining restaurant was also voted into the prestigious San Pellegrino World's Best 100 Restaurants 2010 and has been one of Asia's Top 20 Finest Restaurants in The Miele Guide since 2008. While the place had an all-glass frontage, there were curtains to prevent eyes from prying in to see diners inside. Dimly-lit with dark ceilings and walls, it exuded elegance and opulence without (surprisingly) the stifling ambience. Though, I must say, the entrance was more intimidating than welcoming. Visited on the eve of a public holiday for dinner and were brought to our table with comfortable leather chairs. After a warm mini baguette with crisp (but not hard) outside and soft insides was served, we were presented with fresh ingredients on a trolley and offered options not found on the menu. Taking customers' dietary restrictions and preferences into considerations, dishes and their sizes could be customised accordingly. Started with amuse-bouche of cold and not crispy tempura prawn, which was nothing to rave about. And this complimentary prelude to the meal showcased what to expect – modern French cuisine. We were told its signature cold angel hair pasta topped with Oscietra caviar was so addictively good that many customers came back specially for it. Could taste the truffle in every strand of the pasta good enough on its own, not too cloying and perfect with the caviar. This was followed by another appetiser of Spanish ham wrapped white asparagus with mushrooms. Loved how the savoury ham went well with the otherwise bland asparagus and mushrooms. Truth be told, we were full by then. But we still had a main course each. Mine was charcoal-grilled Wagyu steak, bone marrow and corn served with crispy potato and onion. Both the marbled Japanese beef, and bone marrow which I was trying for the first time, had too much of the melt-in-the-mouth fats that I felt fat eating them and finishing the big portion. Corn and potato were good as palate cleanser but could not say the same of the onion. My dining companion's king crab leg with rice was a smaller portion that was easier to stomach, so we ordered a dessert of Valrhona's Manjari chocolate fondant with vanilla ice-cream. 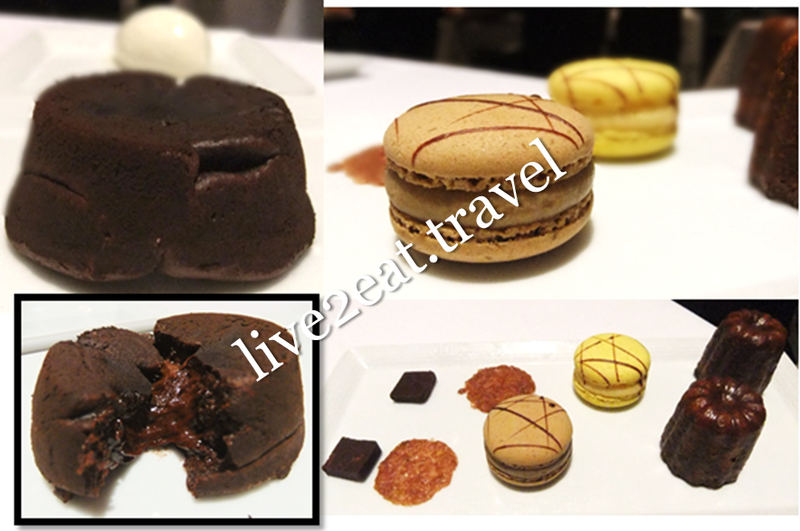 Could neither rave about nor fault it and the petite four which included bittersweet dark chocolate squares, lemon and coffee macarons. I preferred the crisp exteriors of cannelés to its soft custardy centres while my dining companion begged to differ. Service was attentive and professional yet fun and warm at the same time.